At this time of year, you’d expect our extensive range of outdoor furniture hire products to be hugely in demand, and you’d be right! Fetes, carnivals, festivals, weddings and other outdoor events and occasions are in full swing, and guests always need somewhere to relax, so outdoor seating hire is always popular. An integral part of our outdoor furniture rental range are our teak and aluminium tables and chairs, which are hugely versatile and suitable for both indoor and outdoor use. You’ll find that we offer both hardwood and aluminium matching tables and chairs for events, as well as just the lightweight aluminium café tables and chair hire sets. 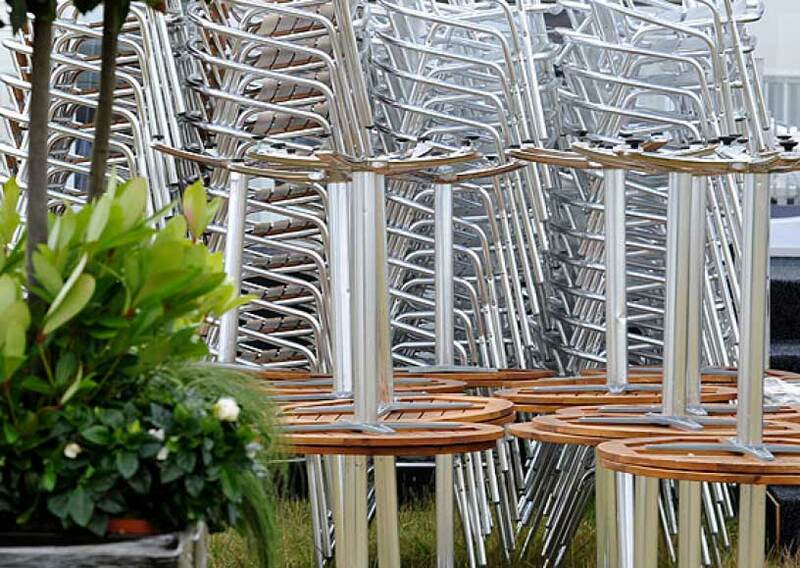 Pictured here are some of our aluminium & teak chairs and tables stacked up at the recent Royal International Air Tattoo, having been placed outside the corporate hospitality area, ready to be positioned and set up the day before the start of the event. As you can see, these chair and table patio sets are stackable, making them easily transported and then positioned at the event, whilst also providing a robust seating hire option for event professionals for almost type of event. For the complete range of outdoor furniture hire for events, why not contact the Event Hire UK team today for the complete chair hire and event seating hire solution.